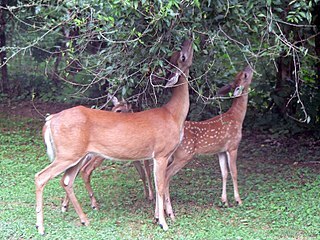 English: A pair of white-tailed deer (Odocoileus virginianus) grazing from a tree. actuel 17 juin 2007 à 13:23 1 600 × 1 200 (557 Kio) Richard001 Version of Image:Deer.jpg by User:Raul654, with some Photoshop work by w:User:TheCoffee. Ce document provient de « https://fr.wikipedia.org/wiki/Fichier:White-tailed_deer_(Odocoileus_virginianus)_grazing_-_20050809.jpg ».